If one of the outer circles of hell were reserved for hoarders of kitchen tools, then yours truly already has a place reserved for her to peel and scrape, slice and dice for all of eternity. Fortunately, in my current incarnation, I can write about my habit so that you, dear reader, can choose more wisely. 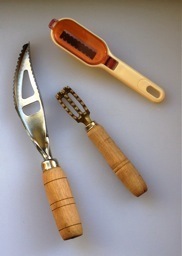 With two new entries on my “What’s this?” page, I share some simple yet useful utensils for cooks who actually cook. I’ve also added my latest favorites: a book on traditional Japanese packaging, paper-mache bowls, and a staple from my pantry. All are short and sweet.